Sometimes the best meals are really a result of some improvisation and unexpectedness. Take these pumpkins, for instance. Here I thought I was well and truly done with pumpkin recipes for this season, but when I came across some irresistibly cute pumpkins at my local farmer's markets I just couldn't resist getting some. Now I have some five kilos of pumpkin to use up. I think I might just have to cook and purée some of it and stack in the freezer for later use. I'm so glad I did end up getting those pumpkins, as this dish is certainly one of my favourite ways to use them. This certainly is the simplest of meals to prepare, but then again, often those are the tastiest and the most satisfying as well. I love the combination of textures and flavours in this dish - the pan fried pumpkin holds it shape and has a bit of a bite to it, and the crunchy nutty seeds and the softness of the egg all complement each other perfectly. 1. Heat one tablespoon of olive oil in a medium sized frying pan. Add the rosemary and the cubed pumpkin and cook until the pumpkin is just tender, but holding its shape. You can add some water (a tablespoon or two) on to the pan if it looks like the pumpkin is starting to burn. Season with a pinch of salt and place on a large platter. 2. Toast the pepitas on a dry frying pan until crispy. Be careful not to let them burn. 3. Peel the hard-boiled eggs and grate them with a medium or fine grater. 4. Sprinkle the pepitas on top the pumpkin and finish the dish off with the grated eggs. Serve immediately. The dish screams AUTUMN out loud! It looks delectable! Fall is beautiful on your side of the planet. That dish is fabulous! So scrumptious looking. It still feels so strange seeing autum when it is getting so hot in here already. Never get used to that. Simply another great recipe. Love it. Your picture of autumn leaves made me miss autumn...although we are just starting to have summer. Beautiful post as usual Maria! Just gorgeous Maria :-) such simple ingredients that work so well together to create something delicious. Three of my favourite ingredients. So simple, so delicious. Divine! It's gorgeous out there! Delicious meal, I love the use of the grated boiled eggs! I think you're onto something good here - the winter salad! Could be a whole new style of cooking. wow! this is so creative! looks great! Love the idea of grating the eggs over the pumpkin! this looks fantastic - you can never have too many recipes for autumn pumpkins. I love the grated hard-cooked egg, will definitely give that a try! What a fabulous and very unique rice dish. I rarely cook with pumpkin just because I find them so difficult to cut, but I may make an exception for this one. What a beautiful picture of fall colors! And the dish looks colorful and delicious too!! That looks delicious. And the dish so perfectly captures all of those beautiful autumn colors. Gorgeous! Although it is summer where I live, your photos and recipes have me momentarily wishing for fall! Never thought I'd see pumpkins this time of the year! Great recipe! i was just stalking foodgawker to see if they took something i submitted and i saw this! looks awesome! and i "see" you all the time on there and TS...your food and photography is always gorgeous! You took me fast forward a few months and made me miss fall :) A beautiful n very appetizing plate of food! What a beautiful and original dish! I have to try the pumpkin this way; love them ! Totally digging that Autumn shot- so picturesque! 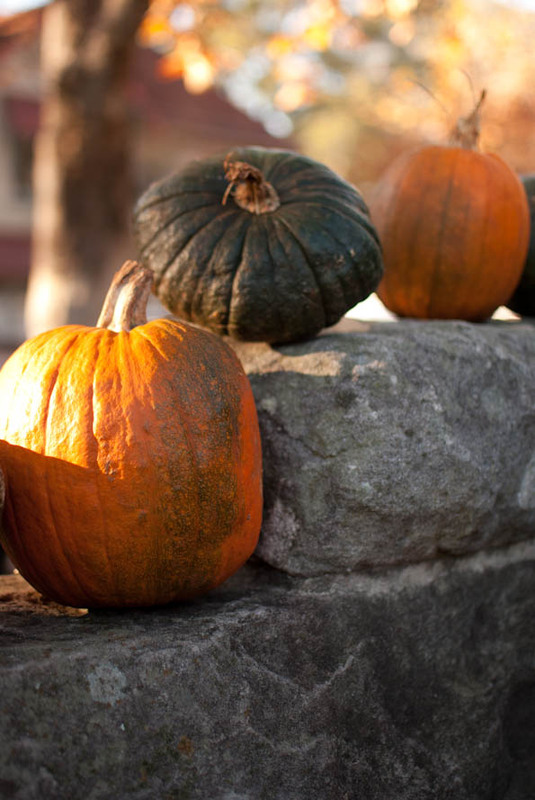 Pumpkins are the perfect vegetable during the colder months. I tend to make a coconut and pumpkin soup..so comforting. I always think I'm done with pumpkin season...and then it's may and I'm still cooking with it. Weird. This looks like one delicious dish! I've never seen grated egg before, but it's a really nice touch! 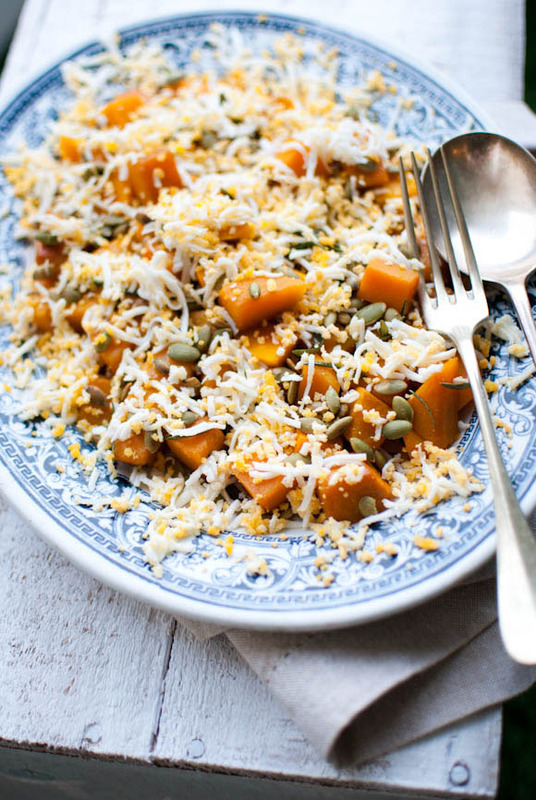 Delicious pumpkin dish, love the pairing with the grated egg! The tree foliage photo is gorgeous! Just stumbled upon your blog and am absolutely loving it. Your photos are gorgeous, and this dish looks fantastic! That's what I like about cooking, make something that turns out great with what you have or need to use up! This one looks gorgeous! Beautiful photos! This makes me long for summer! Love the grated egg garnish. I've just bookmarked this recipe ... can't wait to try it! 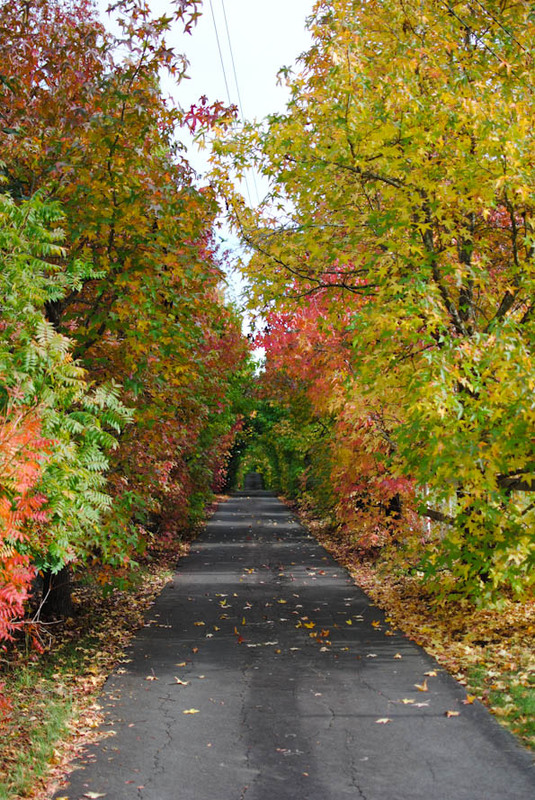 And the autumn lane ... is that in NSW? Nothing like that up here in Brissie :( sigh. Catty: You could serve this instead of a salad or as a side dish. Both would work really well, I think! Amanda: Yes, NSW! We've had some gorgeous autumn colours this year! 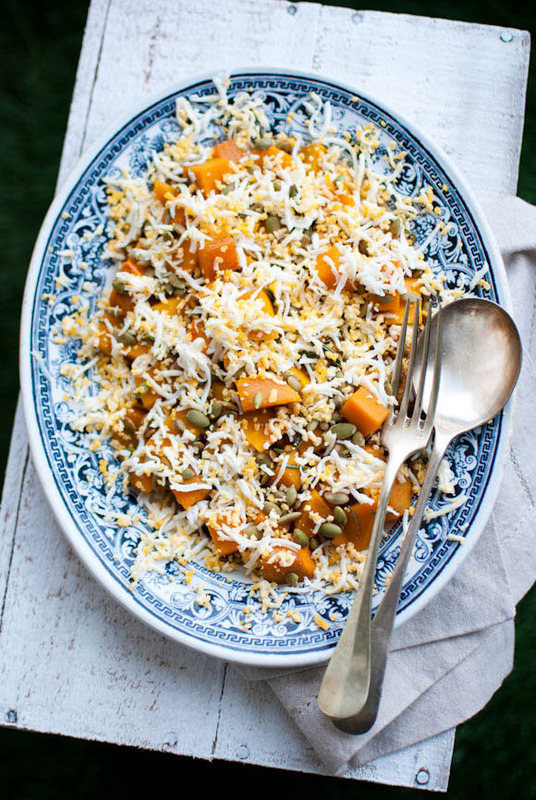 I love pumpkin and like the idea of grated egg over pumpkin. It looks beautiful! Your pictures are gorgeous! We have temps nearing 100 . . . and I love it . . . but enjoyed looking at fall's colors! !